The Final Heart Walk Countdown is ON! Well, after months of preparation, the Heart Walk is just 3 days away and we’re all “a buzz” around here with final preparation details. It’s cold and unseasonably rainy in Santa Barbara today but the forecast for Saturday is clear skies, sunshine and mild temps! It should be a gorgeous day. So, for those of you who planned to donate and haven’t yet, now is the time to go online to make that donation (www.sbheartwalk.com). Once again, we’re blown away by your response. Our goal was to hit 10,000 and we’re very close. The total for Team Rudy as of today is $8, 961.00!!! Amazing!!! Thank you, thank you!! For those of you who are planning to come to the walk, please shoot to arrive at the Fess Parker Doubletree Resort by 9:00am. We’ll set up a “Team Rudy” tent in the grassy area across the street from the Fess Parker rotunda and we’ll meet there at 9:30am to distribute “Team Rudy Balloons” so we can walk to the starting line together. The 5K walk starts at 10am. We will meet back at the tent after the walk at 11:30am to have cake and a little birthday celebration for Rudy so please feel free to come and enjoy the celebration even if you don’t plan to walk. Come dressed in “Rudy Blue” and ready to have some healthy fun! I wish you all could join us…but know you’ll all be with us in spirit! There will be many on our hearts on Saturday including the dear heart friends we’ve lost since Rudy was born…we’ll walk not only in honor of Rudy but also in dear memory of friends including Katie Manning, Baby Angel, Logan Elliott, Josiah Wilson, Ethan Skidmore and Jadrian Glick. These little lives that impacted us deeply are not forgotten and remain a constant inspiration in our journey with Rudy. 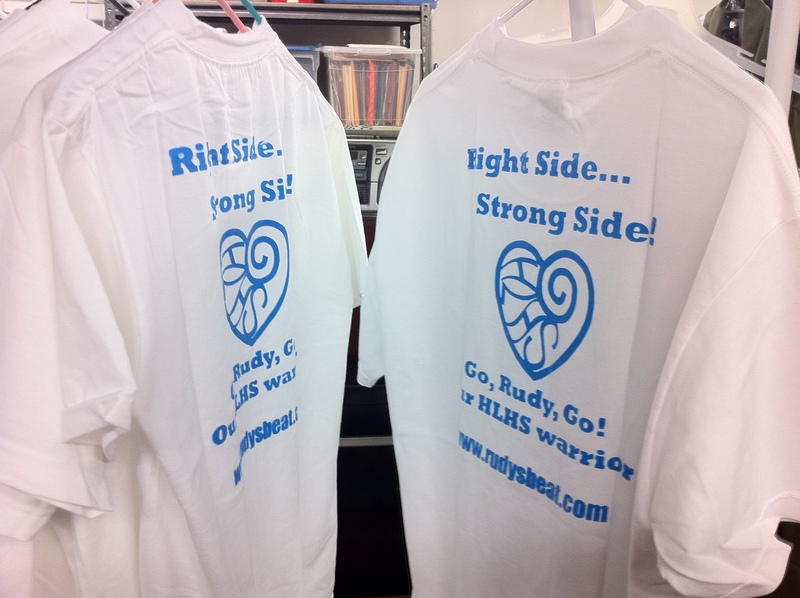 Olivia and Rolf making "Team Rudy" t-shirts! I was just going through some papers on my desk and found a printed copy of your post from 9/13/10 talking about Rudy’s condition and the Glenn procedure. In your prayer request at the end you included these words, “pray fervently and specifically in preparation for the Glenn…whenever it happens.” You also said, “We pray for God’s continued protection and mercy AND perfect timing for surgery as we prepare to move forward.” Hard to believe its been over a year of waiting for God’s perfect timing and to think of all that’s happened in the past 12-13 months. WOW! God has been so good, even though the path ahead is filled with as many uncertainties as before. Bless you, Trish and Rolf, for the loving, self-giving, daily effort you have devoted to Rudy and his sibs. Your actions and attitudes give glory to the God who gifted Rudy to you. Love you! Have a GREAT time on Saturday! Have a good time Saturday with the heart walk. I will be thinking of last year with you at that event and the beautiful setting. I am wondering how Fess Parker Resort was chosen for the venue this year. Will you make the front page of the newspaper this time Rudy? Love to the whole family. Go Rudy, team Geyling and to all the walkers for this great cause!! I love my Rudy Shirt!!! Also, happy birthday to you Rudy!!! Love, hugs and lots of kisses!